Rated 3 out of 5 by pennmom36 from ANOTHER GAME ABOUT SAVING MY SISTER AS TOLD A THOUSAND TIMES BEFORE Rachel and Fiona had just left the store when a speeding truck appeared out of nowhere, sideswiping young Fiona. Rachel rushes to her sister's side, only to find that she's not ALONE IN THE MIST, when a stranger appears, and then disappears with her baby sister! Rachel wanted to scream for help, but another man appeared out of nowhere, she froze, paralyzed with fear. Help is THE NOISE SHE COULDN'T MAKE, but the man assures her that he is here to help save Fiona. 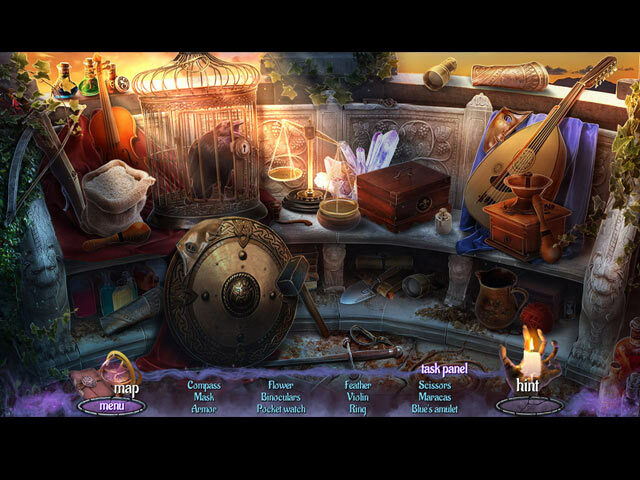 Rachel is told that her sister has been taken from REEL LIFE, by one of the three spirits of fate during a GAME OF GODS. To save Fiona, Rachel will have to pluck the STRINGS OF FATE, and leave the comforts of THE SOARING CITY behind, to discover the MYSTERY OF ANOTHER WORLD. Fiona has been taken to THE PANTHEON of the land of the forgotten where it doesn't take a VIRTUAL DETECTIVE to figure out this LOST TALE. Rachel only has one shot to save her sister before both sisters lose their memories in the land of forgotten. Just one chance, because you cannot RETURN TO ANOTHER WORLD that you don't even remember! I'm sure this game will receive many 5 star ratings, but for me, the storyline wasn't interesting enough to merit 5 stars. Not only is the plot similar to many other games, it's also already been done in this series, in Game of Gods. As I was playing the demo, I found myself distracted a few times, looking outside the window, at the birds and horses, which is a good indication that the storyline can't immerse you wholeheartedly. It's a good game, but not epICc. The Collector's Edition version doesn't have a whole lot of frills to offer, other than the usual Hidden Flowers (usually one red, one white in each scene) and 12 Morphing Characters. In my opinion, this Standard Edition version, is the better choice, because finding collectible flowers isn't worth paying twice as much money. 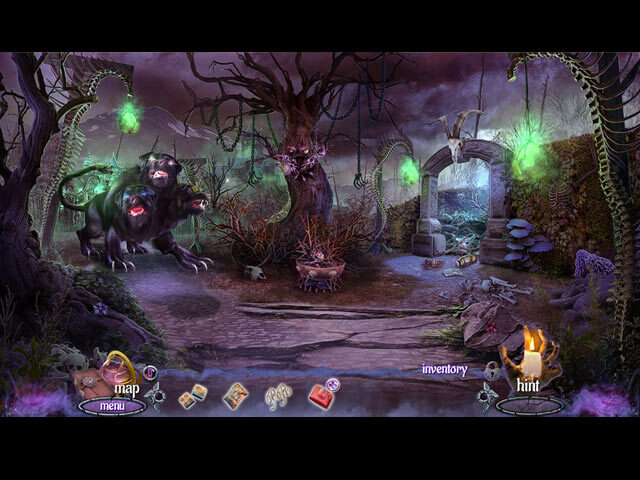 The Hidden Object Scenes are varied with Listed Item Finds, Silhouetted Shape finds and Multiples of a single item find. Some HOP's have a small Mini Game to solve, and some of the Mini Games are more like a HOP. 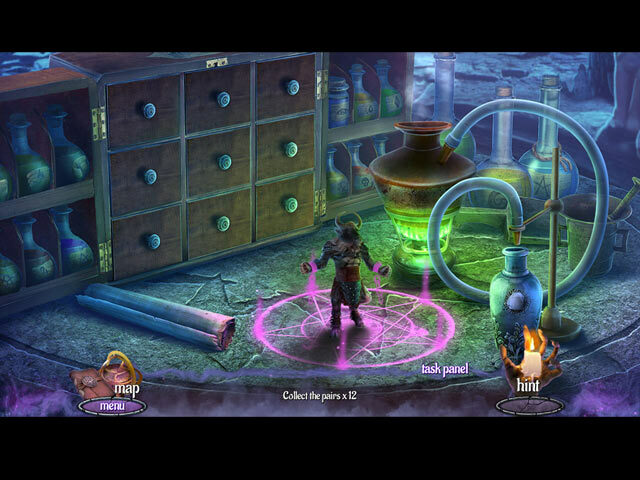 The Mini Games vary in difficulty, but nothing really challenging. Below are brief descriptions of some of the games you'll encounter during the demo: 1) Drag items to the correct place in the scene during a short story. 2) Select a numbered path, 1-3 (scan over with mouse to see the projected path route) and click at the right time to avoid being caught by the guards. 3) Disable the infra red cameras in the correct order. 4) Connect the dots to recreate the picture shown on the instructions. 5) Arrange the figurines on the shelves so that no matching one shares the same row or column, either horizontally, vertically or diagonally. 6) Combine the stone halves in the center circle in the order shown on the clue. The top button rotates pairs the bottom button moves the pieces to the center circle. 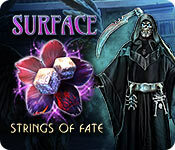 SURFACE GAMES AVAILABLE: -Alone in the Mist (CE 6-4-15) -Game of Gods (CE 11-20-14) -Lost Tales (CE 6-16-16) -Mystery of Another World (CE 2-2-12) -Reel Life (CE 4-10-14) -Return to Another World (CE 11-21-15) -Strings of Fate (CE 6-3-17) -The Noise She Couldn't Make (CE 7-26-12) -The Pantheon (CE 9-18-13) -The Soaring City (CE 1-24-13) -Virtual Detective (CE 11-26-16) The Collector's Edition has 140 Collectible Flowers in each scene (which unlocks the Secret Room), 12 Morphing Characters, replayable Hidden Object Scenes and Mini Games, 11 Achievements to Earn, 10 Wallpapers, 10 Concept Art pictures, 5 Music Soundtracks, 1 Screensaver, a built in Strategy Guide and a Bonus Chapter, enjoy! Rated 2 out of 5 by Yanie1020 from What's Happened to Elephant Games? Elephant used to be a favorite developer of mine. No longer. Their games have nothing new or original. I feel like I'm playing the same game over & over. The mini-games are either way too easy or they're just like all the others they offer in other games. Elephant is probably fine for beginners, children, or people who don't care for a challenge. It's just not for me anymore. Rated 2 out of 5 by roaming from Too Weird For My Taste By the time I got to the end of the demo, I'd forgotten what "The Game" was about, why my sister had been kidnapped, who the two guys fighting over her were, and why they were fighting over her. Besides that, there were too many puzzles and too few HOS. I dislike puzzles. Even some of the HOS were more like puzzles than HOS. I thought about rating it only one star, but the artwork is decent, so I added a star for that. Rated 2 out of 5 by Pilot1 from What a disappointment! I have three of the previous ‘Surface’ games, and enjoyed playing them. So, when I saw another in the series available I thought it might make a good addition to my collection. I was wrong! Quite frankly, I am at a loss to understand the high rating given this game by some other reviewers with whose opinions, generally, I find myself in agreement. The story is one we’ve played far too many times —sister taken by an evil being, only we can accomplish the rescue, and then only after undergoing many trials, finding various items of essential value and, of course, by defeating the entity. Even though, as I’ve frequently said, there are a finite number of plots that lend themselves to games of this type, and many of them offer a sufficient twist to make the game interesting, the developer of this game didn’t even make a pretense of a twist. This is just more of the same old story. The graphics are stunningly bad! The characters, and other essential items, appear to be merely laid over a static background. The music, various sounds, and voice-over narratives are equally poorly done. HO sequences and mini-games are, again, of the same type we’ve endured over and over again from developers too lazy to innovate. I always end my reviews with the caveat that you play the demo and decide for yourself, but not this time. This is such a poorly made product that I recommend that you save your download limit for a game far more worthy. Rated 2 out of 5 by BooksandGameFan from Everyone has an off day and this is Elephants! I'm a little late posting my review and it most likely will not be seen by many if anyone but I just wanted to put my two cents in just in case someone is on the fence about purchasing this game. DON'T! I've played all the Surface games, Mystery of Another World, Game of Gods and Soaring City are 3 of the best games I've ever played. I enjoyed all the others as well except for Noise she couldn't make. This game is better than the latter but not by much. I just found this game to be very boring with the same ole, same ole, find an amulet put it here, rinse and repeat. The story line had great potential it just was not executed properly. It was also a kind of short game but in this instance, that was a blessing. Sorry just nothing here to be excited about.